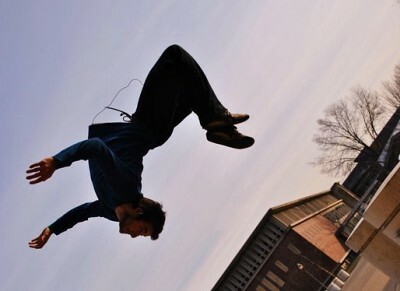 Sebastien Foucan (the man accredited with the founding of “Freerunning” and host of the website http://www.freerunningtv.com/) recently interviewed the accredited founder of Parkour, David Belle. The two have been friends since childhood and trained together for many years, and lately both have become aware of a shift in the reasons why people involved in these disciplines train. Back when they first started training these men, and the rest of the Yamakasi, trained in an effort to strengthen themselves and the people they trained with. Their name, “Yamakasi”, originates from the African Congolese Lingala language meaning loosely ‘Strong Man, Strong Spirit’, and it sums up the original and still core aim of their discipline – to be a strong individual: physically, mentally and ethically (http://en.wikipedia.org/wiki/Yamakasi). However, Sebastien, David, and other pioneers of these disciplines have started to vocalize their thoughts on this shift in attitude. For the interview follow this link to see Sebastien Foucan interview David Belle. Their fear is that people these days are wandering away from the deeper meaning of Parkour and Freerunning. They see all of these kids who are introduced to these disciplines by videos on youtube and immediately they think it’s all about producing the best looking and flashiest video edit, being able to do the biggest tricks and sickest flips. Wisely Foucan and Belle are both extremely hesitant to call this shift “bad” or a “negative” thing, they merely say it is just different from how they see things. Being someone who sees eye to eye with them, I agree with their phrasing. It is not inherently “bad” or “worse” to train in Parkour and Freerunning for the, at least partial, purpose of showing off, it merely makes the disciplines mean something different to the person training for that reason. If what you value is being the first to throw triple-flips with impunity for the sake of being put on adverts and featured in movies, more power to you. But if you seek something else, like to strengthen and grow as an individual and help those around you do the same, Parkour and Freerunning offer that as well. What it comes down to is figuring out what you want from Parkour and/or Freerunning. For the officers of this club, they mean to us what they mean to Foucan and Belle. We wish to grow from the experience, both physically and mentally, and even have fun while doing it. Parkour and Freerunning are amazing in that they can give you just about anything you seek provided you put in the effort. So, I’ll leave you with this, listen to why other people train. Listen to the Foucans, the Belles, the Shieffs, the Ilabacas, the 15 year olds who just watched 100 youtube videos in one day and decided they want to start training, the gymnasts, the breakdancers, and even the “e-runners” -those self proclaimed experts on these arts who have not trained a day in their life but can rattle off the top youtube videos like they’re scripture. Listen to all of them. But, never, NEVER, take what they say as the absolute truth about Parkour or Freerunning. That is up to you to decide. Take that knowledge you get from listening and use it to formulate your own ideas and opinions about what they mean to you. As the title of Sebastien Foucan’s book wisely says: “Find your way”. PK/FR are not static. They are fluid and can be as complex, simple, profound, or shallow as you make them. You should really find that movement can bring you to whatever place you’d like to be… after you learn a few skills in each “movement category” you are more and more free to express yourself. If you like dancing, martial arts, gymnastics, etc. you should still have a solid basis in environmental navigation, if you can’t move then you are a prisoner. You are a prisoner to your own body (which isn’t strong enough to support you) and you are a prison to a society where people walk along designated paths and sit more than any human should. Just my opinion of course, take your own path, I simply want to share the freedom that comes with movement with all who will listen. Hello parkour community. Recently a couple car loads of UMass students went out to Boston to see the second part (the first being in Tampa) of the first set of freerunning competitions in America. Training with professionals was great and there were a lot of awesome kids who came out to the city like us to train. 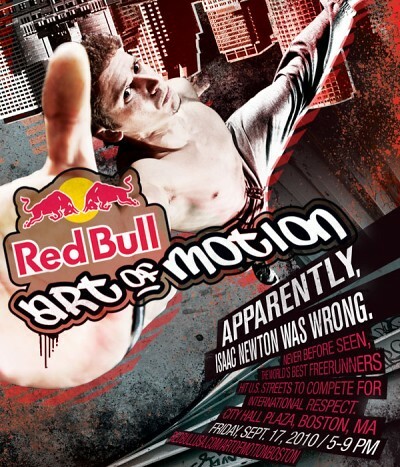 Red Bull has put up some nice photos here: Art of Motion: Boston. As for the rest of the semester, we will be practicing regularly (every weekday but friday) and jamming on saturdays as long as the weather isn’t too unforgiving. Check out facebook page for details on practices and other meetups. Also, we are finally starting to get some mats, soon enough we’re going to need our own training gym (the “kong vault” anyone?) Currently we have two vault boxes, two precision trainers, and a couple of beat up mats. If anyone has any old gymnastics equipment or any other useful object that they no longer use… please get in contact with us, we’ll even pick it up! Also, if you haven’t done these two things already… please do. 1) Sign a Health Waiver (applies to anyone who attends) and 2) if you want to be an official member (applies to UMass students only) you need to join up on Campus Pulse. Thanks. Finally, we’ve got a few things happening this weekend. We’re starting to release a series of training videos on UMPK’s Youtube Account and we’re hosting a Saturday Jam at 2:00pm, meet up in front of the Fine Arts Center. Thanks for reading, train hard and train safely! Now go practice some movement!